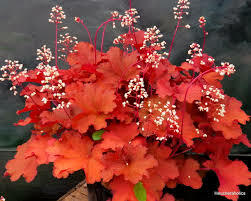 Heuchera has very attractive foliage and can be used as ground cover. Easy to grow, does well in partial shade or full sun. Heuchera has very attractive foliage and can be used as ground cover. Bell-shaped flowers and heart shaped leaves ranging from purplish brown to green and greenish white flowers. Height: 1 – 2 ft.